You are here: Go to home Breadcrumb Separator Leisure Centres Breadcrumb Separator Cambridge Breadcrumb Separator Parkside Pools and Gym Breadcrumb Separator News Breadcrumb Separator Cambridge and Oxford go head to head in boat race rowathon challenge! Cambridge and oxford go head to head in boat race rowathon challenge! Staff and customers at Parkside Pools & Gym are pulling together to see how many miles they can clock up on an indoor rowing machine in a day, and they need your help to beat a rival team in Oxford! 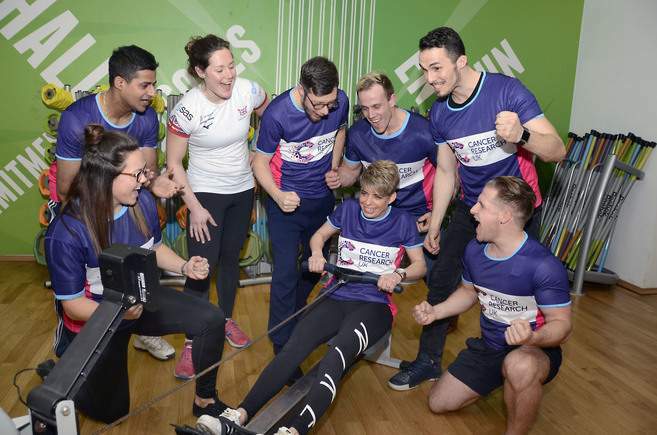 The rowathon will see a team from Better’s Parkside Pools and Gym go head to head with their counterparts in Oxford in a race against the clock – the team that rows the furthest will be the winners! Anyone over the age of 11 is invited to take part and get into the competitive spirit ahead of The Cancer Research UK Boat Race which takes place next month. 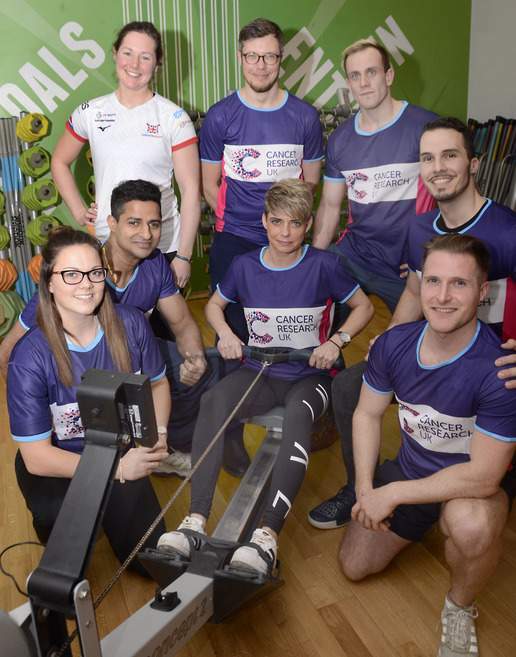 The challenge, taking place this Saturday (March 10th) will raise money for Cancer Research UK and coincides with Better leisure centres opening their doors for free every Friday in March to people taking part in The Great Row! The Great Row sets people the challenge to go the distance and cover 26.2 miles on an indoor rowing machine, in stages or in one go during March in aid of Cancer Research UK. Aspiring rowers can take on The Great Row as part of a team or they can sign up for a solo effort. Mum of two Terrie Waters is one of those who’ll be helping Team Cambridge win the rowathon on March 10th! She knows first-hand why funding for research matters. The 42-year-old lost her mum to bowel cancer 19 years ago. Diane Cox was 52 when she died. Diane was first diagnosed at the age of 46. She was given the all clear but the cancer returned and spread. Terrie was a new mum at the time, her daughter Jade had just been born and Terrie was devastated by the loss. She has dedicated her life to helping others in her mum’s memory. She has taken part in Race for Life, will be running the Cambridge Half Marathon and will be doing the rowathon along with her son Jake, 12. Terrie, a regular at the Better’s Abbey Gym, said: “It never gets easier, I thought that it would but I see all of the things my mum missed out on. She met my eldest daughter but not my son. She missed birthdays, parties, school plays, all of the special moments. The rowathon will take place between 9am and 1pm in the reception area of Parkside Pools and Gym. Anyone over the age of 11 can have a go. At the end of the event, the miles will be tallied up to see who wins – Team Cambridge or Team Oxford. They will have collection buckets at both sites so that people can donate to Cancer Research UK. Sarah Taylor, Community Sports Officer at Better, said: “Whether you are there for two minutes or 20 minutes it all helps beat our rivals in Oxford – and more importantly it will help raise money for a great cause!" The Great Row is part of a wider partnership with The Boat Race following BNY Mellon and Newton Investment Management’s decision to pull together and generously donate their headline sponsorship rights of the event in January 2016. It coincides with the world famous Oxford & Cambridge Boat Race, now known as The Cancer Research UK Boat Race, which take place on 24th March. Melissa Wilson, a Team GB and former Boat Race rower, is not eligible to take part this year for Cambridge but she will be cheering the crews on. She is also backing Team Cambridge for the row-athon and is encouraging people to sign up for The Great Row. Melissa said: “I was never very sporty when I was younger - I never saw myself doing this but I tried rowing and really enjoyed it." Ask a gym instructor or watch some videos to learn the correct technique - the British Rowing website has some guidance. It’s not a very natural movement, but is simple once someone shows you! Don’t try and move really fast, most rowing training is about finding a steady pace and a comfortable rhythm. Take it gradually at first, set manageable goals and enjoy it!